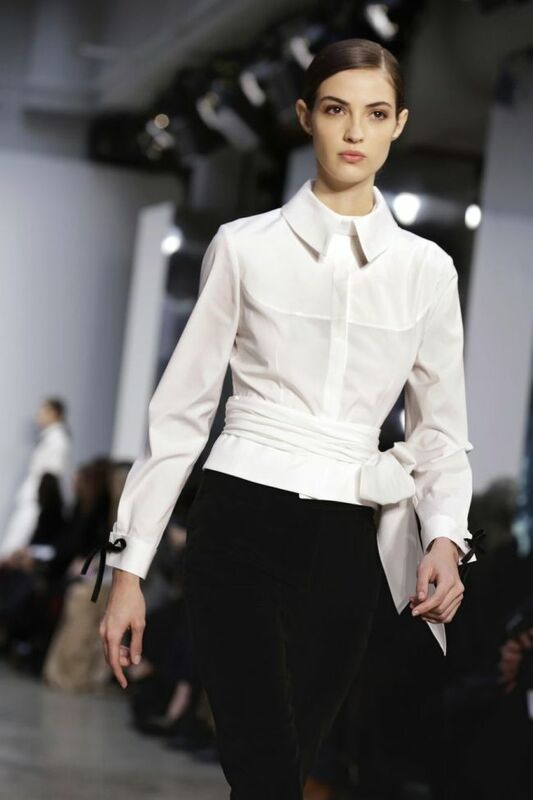 Carolina Herrera called it her “white shirt” moment, a celebration of her favorite garment. And the Proenza Schouler label said adieu to New York Fashion Week for now, as it prepares to show in Paris. This Herrera collection seemed to have a more relaxed vibe, with a number of models wearing flat granny boots, for example, as they strolled the runway in white shirts and black skirts. Herrera was in the news lately for designing Ivanka Trump’s inaugural gown -- a sparkling, long-sleeved, blush pink number. Herrera’s white shirts were all crisp, of course, but they came in different styles, and many of them sported bows: at the collar, around the waist, or on the puffs of sleeves. As the show transitioned away from shirts, the bows reappeared everywhere: at the pockets of a coat or on filmy gowns, at the shoulders or around the neck, on the back or at the front. Standouts were a stunning sleeveless teal gown with a V-neck and a black strip around the waist; a burgundy crocheted dress; and a gown with a black bodice and a tiered, black-and-white skirt. Asked by someone backstage to define their collection in three words, designers Lazaro Hernandez and Jack McCollough of Proenza Schouler had an easy answer: New York City. The duo is moving to Paris next season -- not moving their company or home, but showing at Paris Fashion Week rather than New York. So they were in the mood to say a nice goodbye. Especially with the energy -- political energy, that is -- that they’ve been feeling.